Offering ocean views just over the sand dunes and easy access to the seashore right across beach road, Off the Bucket List is an excellent spot to spend your next Outer Banks vacation! 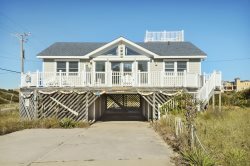 Centrally located at milepost11.5, this 4-bedroom vacation home in the heart of Nags Head truly has it all. For a day of fun in the sun along the shoreline, walk just 485 feet to the Bonnett Street public beach access, which features a brand-new bath house for the 2018 season, a volleyball court, picnic tables and a lifeguard station during the summer months. When you’ve had your fill of splashing in the surf for the day, head back to the house and hop into the bubbly hot tub or take a dip in the huge private swimming pool to cool off on a hot summer day. A spacious living area on this vacation home’s top level provides plenty of room for your family to spread out. Lounge on one of the comfy couches to watch your favorite shows on the flat-screen TV, or spend quality time with loved ones at the large dining room table, where you can enjoy a delicious homemade meal or get together for a fun-filled game night. In addition to being just steps away from the beach, Off the Bucket List is also conveniently located within minutes of an assortment of Outer Banks restaurants and attractions. Tortugas Lie—a local favorite that serves everything from seafood and sushi to burgers and Caribbean fare—is just a quarter-mile down the beach road. This Nags Head vacation rental home is also just steps away from Galaxy Golf—a 36-hole miniature golf course with an outer space theme—as well as the brand-new, 5-acre Dowdy Park, which boasts playground equipment and recreational opportunities for kids of all ages. Fishing enthusiasts will enjoy Off the Bucket List’s proximity to the Nags Head Fishing Pier. Located just a half-mile down the beach road, this Outer Banks hot spot offers excellent pier fishing opportunities, as well as a restaurant, oceanfront bar, live music and stellar sightseeing. For a day of outdoor adventure, take a five-minute drive to the south to Jockey’s Ridge State Park. Strolling along one of the nature trails that wind through the sand dunes is a great way to witness area wildlife, and a hike to the very top of the ridge is an excellent spot to take a hang gliding lesson—or to catch one of the stunning sunsets that take place as the sun slips into the shallow waters of the Roanoke Sound to the west. When you vacation at this beautiful ocean side Nags Head rental home, you’ll have the chance to mark a wide array of activities and adventures “Off the Bucket List!” Book your stay today, and let the countdown to your OBX escape begin! Beach Access: Just 485 feet away at the Bonnett Street public beach access! For more pool information, Click here. It all starts with a luxurious Seaside vacation home or condo in one of the world’s most beautiful beachside communities.